i've had numerous requests for an update...i can't believe you guys aren't sick of me yet! thanks for being such faithful readers. things were much easier for us this week TESOL-wise. we are now officially halfway through...woohoo! we're all ready for the next 2 weeks to go by quickly. currently, we are enjoying a long weekend. the 14th is when koreans celebrate Seollal, or the lunar new year. this is one of the country's 2 biggest holidays. the city is quiet as most people travel to visit their families and most shops close down for a few days. 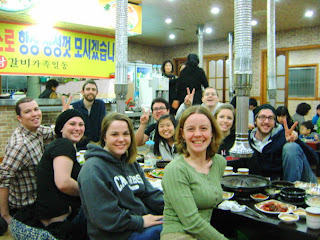 our teachers were gracious and gave us no homework for the weekend, so we are all enjoying the time to relax, explore, and (personally) study korean. we were all able to get our cellphones this week! it was a long and grueling process, taking about 3 hours with alot of communication via hand motions, broken english, and minimal korean. it was also a hilarious experience, as the cell phone store employees got so excited to have so many new contracts signed at once. they all started clapping and yelling and shouting: "we love you! we love america!" towards the end, the manager started running around and handing out bills of 10,000 won and shouting "discount, discount!" hahaha. it was like a little party in the cell phone store. they have become our new friends - i was walking past yesterday with one of the other teachers when the manager happened to look out the window and see us. he yelled and ran out the door to meet us and walked a block with us, just talking in the little english he knew and laughing with us. koreans are so friendly! 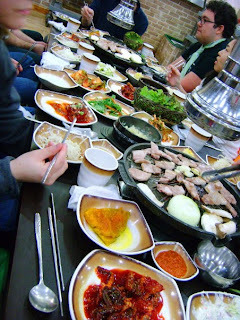 i should probably note, too, that this entire meal cost each of us a little over 5,000 won. that's equivalent to about $5 USD...and we considered this meal to be a little bit on the expensive side! 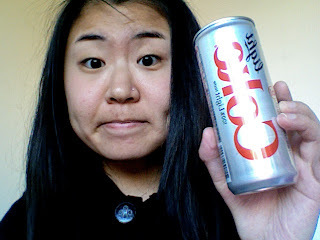 relatively speaking, everything is so much cheaper in korea! this country is full of broken english and improper translations, and it's so funny. just walking down the street, you will see signs and things written totally wrong and just laugh your head off. a good example was when i was looking up movie listings today. the local theater normally plays all korean films and then about 2 american movies. i saw avatar and then this other movie i could not figure out for anything. after a good 2 minutes of racking my brain, i finally realized that "if the food falls from the sky" was "cloudy with a chance of meatballs." hahahaha! korean has alot of sounds that english doesn't have, and vice versa. so you sometimes just have to make do. 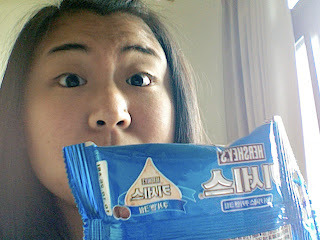 this literally reads (backwards, of course): hershey's kee-sye-se. 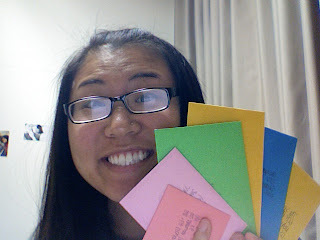 oh and i'm currently on a card-writing frenzy. the post office workers here now recognize me when i come the door as that korean who can't speak korean. hahaha. they know i am always sending to miguk (america). maybe one of these has YOUR name on it?! you'll see soon enough...these will be 미국 bound on tuesday!